- there are so many of them." A bright top covered with flowers is the perfect way to remind myself that Spring is soon approaching. We finally had a break in the snow and the temperatures warmed up enough that I could shed the heavy sweaters and wear a top that was a light and airy. Matching it with these fun cap toe wedges and a purple purse was a great way to pull colors from the shirt. Wearing brighter colors, especially with shoes, is something I'm trying to do more of. I feel that I always stick with my basic black and brown footwear and never venture into colors. There are so many great colored shoe options out there that make me excited and my bank account cringe. What Kimberly said. Love the floral top, and LOOOOOOVE those shoes. Such a pretty top! I saw that at Kohl's and almost bought it! Loving those heels! Plus, with the floral top its perfection! 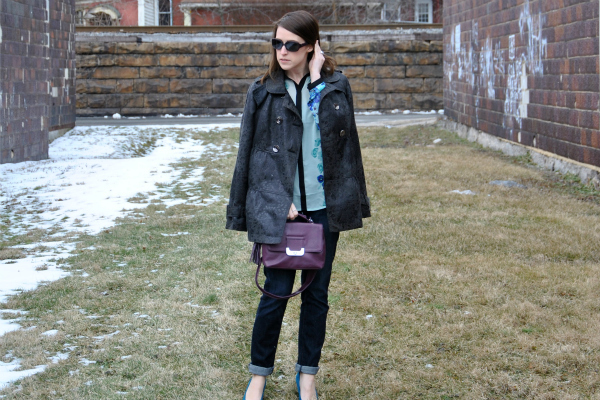 love your bag and shirt, great outfit! Lovely outfit! I love that top and those shoes are fabulous as well! This top looks beautiful on you - great style! great outfit! I love your shoes and your top! 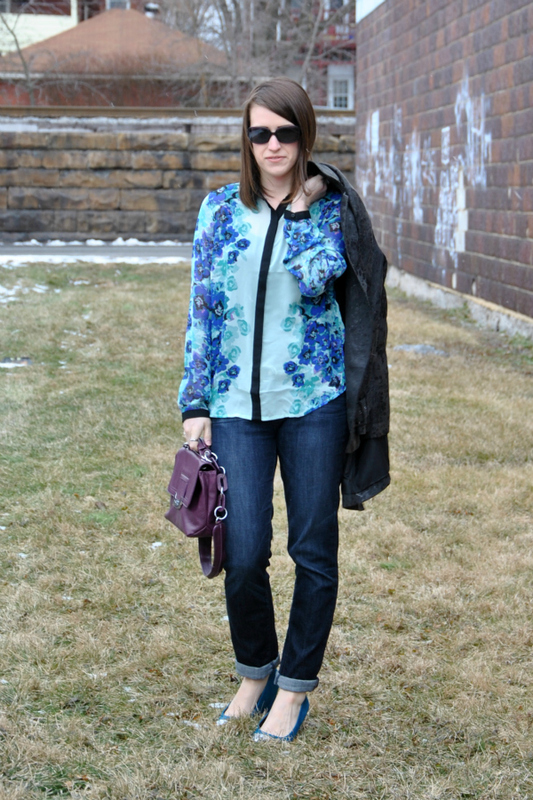 Love that floral shirt, Jeans look comfortable and stretchy. The fit and wash is great.